For sales professionals, email is a crucial part of the job. You’ll use it to respond to leads that submit a form on your site, follow up with prospects you meet in person or via phone call, and may use it as a final channel to finalize meetings or sales. It determines your close rate. How and when you email your prospects could be what helps you close the sale—or what drives your prospect away forever. It affects your customer relationships. Starting an engagement on the right foot could help you set the stage for a much longer, more profitable relationship. It’s a driver of productivity. Even if you have a respectable close ratio, if you spend too much time on email, or use that time ineffectively, your bottom-line productivity is going to suffer. The problem is, if you want to learn more about the specifics of these key influences, you’ll need objective data. Fortunately, the team here at EmailAnalytics specializes in that objective data. 1. Email is 40 times more effective for securing new sales than Facebook and Twitter combined. A McKinsey study found out just how powerful email is for salespeople, especially when compared to social media. If you’ve been using a blend of contact methods to get in touch with your prospects, it might be time to start gravitating toward email. 2. Research suggests that between 35 and 50 percent of sales go to the first-responding vendor. As you’ll see from several of these statistics, the early bird really does get the worm. As many as half of all sales go to the first person to reach out to a contact—which means your response time needs to be as low as humanly possible. 3. 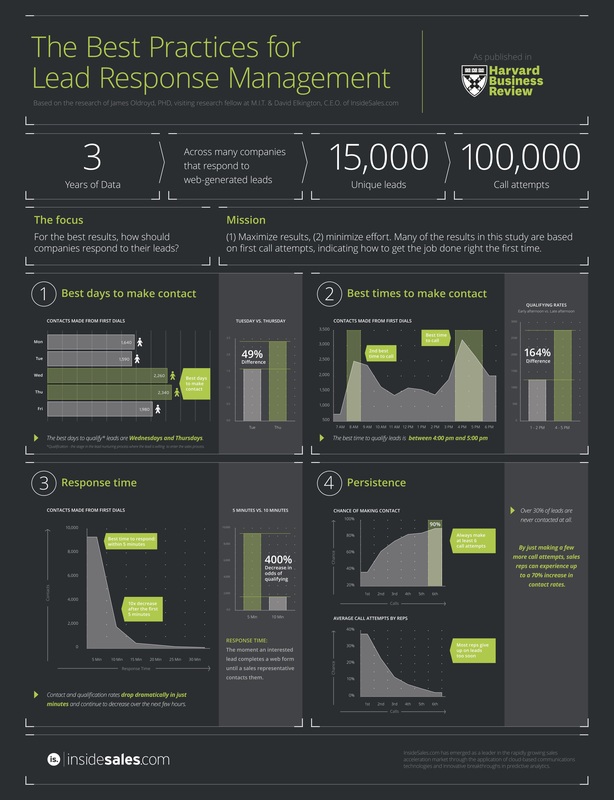 Following up within an hour increases your chances of success by a factor of 7. This analysis studied more than 2,200 companies in the United States, evaluating meaningful conversations as a result of response time. Responding within an hour makes it 7 times more likely that you’ll have a meaningful conversation, adding to the body of evidence that responding sooner can dramatically improve your chances of success. 4. Lead qualification drops 10 times if you wait longer than 5 minutes to respond. The Harvard Business Review found that when you wait more than 5 minutes to respond to a lead, lead qualification drops 10 times over, and there’s a 400 percent decrease between 5 and 10 minutes. These data push beyond the one-hour mark, suggesting that even a few minutes’ delay can affect your results. Busy email days can make this feat nearly impossible, but the closer you get to achieving it, the better. 5. Lead qualification emails are best sent on Wednesdays and Thursdays. The same HBR research found that there’s a 49 percent increase in lead qualification from Tuesday to Thursday, with Wednesday and Thursday representing the best overall days to email. That doesn’t mean you’re strictly limited to emailing on those days, but you may see increased results if and when you do. 6. Only 9 percent of sales emails are opened. If you’re emailing someone for the first time, don’t count on them to open your email. Accordingly, your subject line is going to be more important than the body—and you shouldn’t spend too much time agonizing over the wording of your body content. 7. The average open rate for businesses, cross-industry, is 20 percent. This statistic validates the low open rate, applying it to practically all types of businesses. 8. 21 percent of email recipients will report email as spam (even if it isn’t), and 69 percent of recipients report email as spam based only on a subject line. This study by Convince and Convert indicates the threat of getting your emails reported as spam. You’ll need to be careful about who you email and how you email them; if you get flagged as spam too often, you could get your account shut down. 9. About 33 percent of email recipients open emails based on the subject line alone. The same Convince and Convert study shows that a third of people only consider the subject line when opening emails; if you want to significantly reduce your risk of getting flagged as spam, make sure you’re writing a relevant, sensible subject line. 10. Roughly 24 percent of email opens occur in the first hour after delivery. If you send out emails, be prepared to respond; the vast majority of email opens you receive are going to happen within a day of sending them out. Accordingly, you’ll need to be prepared to respond in record time. 11. 86 percent of business professionals prefer email as a communication medium. In case you were divided on whether to use emails or phone calls, rest easy knowing email is, for the most part, the communication medium of choice. 12. Only 7 percent of companies respond within 5 minutes of a form submission. One study by Drift found that only 7 percent of the 433 companies they tested were able to respond within the first 5 minutes of a form submission. If you manage to achieve this, you’ll put yourself squarely in the cream of the crop. 13. More than half of companies don’t respond to a form submission in the first 5 business days. That same study found that more than half of companies failed to respond to a form submission even after 5 business days. You may not be able to respond within 5 minutes every time, but as long as you’re responding within a day or two, you’ll be able to beat at least half of the competition. 14. Personalized emails get 14 percent more click-throughs. If you copy-paste the same email to all your prospects, don’t expect to get the same results as a personalized effort. It may take a few extra minutes to personalize your message to the prospect you’re emailing, but it’s worth it. 15. Personalized emails get 6 times as many transactions. This finding is confirmed by multiple studies; personalization gets better results in almost every category. 16. Personalized subject lines get 26 percent more opens. Remember, open rates are low for sales emails. If you want a shot at getting a higher open rate, make sure your subject line is personalized as well. 17. The average emailer deletes 48 percent of the daily emails they receive. According to the infographic by Boomerang, which itself was the result of studying more than 5 million emails, the average person deletes nearly half of the emails they receive each day—71 out of 147 messages. Your subject line and message need to be valuable if you want to make the cut. 18. There’s a spike in email interest between 5 am and 6 am. Most people think email reading activity spikes between 9 am and 10 am. The reality is, the biggest spike in reading activity is between 5 and 6, with less significant fluctuations throughout the day. This may be surprising, since most advice tells you to email around 9 am or noon, but you might be better served emailing earlier in the morning. 19. The words in your subject line matter. Boomerang also found a strong correlation between the words in your subject line and the eventual success of the email. Success words included: apply, opportunity, demo, connect, payments, conference, and cancellation. Failure words included: confirm, join, assistance, speaker, press, social, and invite. 20. The words “alert” or “breaking” can net you up to a 1 percent higher open rate. This is because people associate these words with a sense of urgency, driving them to take action now, rather than waiting. 21. All-caps emails only get a 34.6 percent response rate. A separate Boomerang study of 300,000 emails found that emails with a subject line in all caps were 30 percent less likely to get a response, relative to the other emails in the set. I can’t think of any instances when using all-caps is a good idea. 22. Salespeople spend 21 percent of their day writing emails. Salespeople only spend about a third of their day actually selling, according to one Hubspot study. In fact, they spend 21 percent of their day writing emails and another 17 percent entering data. While emails are a great sales tool, they can also be a tremendous waste of time if you aren’t using them effectively, or if you’re mismanaging your time while emailing. 23. Salespeople send an average of 4 messages per day. When you count email, calls, voicemails, and social touches, the average salesperson sends around 100 messages a day. If you’re sending significantly more or less than that, it’s not an immediate indication that you’re doing something wrong, however; the quality of those messages is what really counts. 24. Salespeople spend an average of 13 working hours per week on email. You’re likely spending a third or more of your work week drafting, sending, reading, and managing emails. Accordingly, your email productivity serves as a microcosm for your productivity overall. If there are any bad habits or missteps that compromise your effectiveness here, it has the potential to compromise your entire job performance. 25. Emails written at a third-grade reading level are ideal. Back in 2016, Boomerang conducted a study of more than 40 million emails—the most of any study on this list so far—to discover the secrets of emails that get responses. They found that emails written at a third-grade level got a 53 percent response rate, compared to a 46 percent rate for those written at a kindergarten level, 45 percent for a high school level, and 39 percent for a college reading level. 26. Emotional emails get 13 and 15 percent better response rates. The same study showed that emails with negative emotions got 13 percent more responses than a neutral control group, while those with positive emotions got a 15 percent increase. I don’t suggest using lots of negative emotions when emailing new prospects for the first time, but any emotion is better than no emotion. 27. The ideal email for generating responses is between 75 and 100 words. With a 51 percent response rate, emails of 75 to 100 words are perfect for getting responses. Too much longer or shorter than that, and the response rate starts to taper off. Similarly, emails with shorter subject lines tend to fare better, with 3 to 4 words being ideal—that’s right, just 3 to 4 words is enough to maximize the value of your email. 28. Emails with questions get 50 percent more responses. It shouldn’t surprise you that emails with questions tend to get answers. In fact, this same 2016 Boomerang study found that emails with 1 to 3 questions got replies 50 percent more often than those without any. Make sure you’re engaging with your prospects, and not just talking at them. 29. Lists with less than 200 prospects have the highest response rate at 18 percent. A study by Woodpecker found that lists with 1 to 200 prospects got an 18 percent reply rate, while lists of 200 to 1,000 prospects got an 11 percent reply rate, and those with 1,000 or more prospects got an 8 percent reply rate. This doesn’t mean that having more prospects is inherently less valuable, but it is an indication that narrower, more concentrated lists result in more engagement from your audience. 30. 4-7 emails in sequence can triple your reply rate. The same study found that sending 1 to 3 emails in sequence got a reply rate of 9 percent, while sending 4 to 7 got an average reply rate of 27 percent. It’s a major indication that persistence and consistency can be very rewarding in sales emails. 31. The word “New” can boost open rates by 23 percent. People appreciate novelty in their lives. Make sure you’re sending them something new and original. 32. The ROI of cold emails is twice as high as the ROI for cold calling. As if you needed another reason to prefer email as your medium of choice, companies tend to see a return that’s twice as high for email over phone calls. 33. Roughly 80 percent of prospects say “no” 4 times before they say “yes.” Despite this, 92 percent of salespeople give up after getting 4 “no’s” from a prospect. Being persistent and following up with people, even after a negative response or no-response, can be rewarding. 34. 5 emails is the ideal number. A separate study confirmed that multiple emails are almost universally better, with 5 being the magic number. 35. The average salesperson only makes 2 attempts to reach a prospect. You don’t have to go crazy to beat the competition; most salespeople never go beyond 2 attempts to reach someone over email. 36. Adding a sense of urgency can improve your open rate by 22 percent. If you want people to be excited to open your email, you have to give them the sense that it’s important to open the email immediately. Otherwise, they may make an excuse to procrastinate opening the email indefinitely. 37. The best email subject line for salespeople is Re:. A study by ContactMonkey found that the best subject lines for open rates are “Re:” at 92 percent, “Re: follow up” with 90 percent, “Re: update” with 89 percent, “Re: introduction” at 88 percent, and “Re: checking in” at 87. Notice a pattern? The worst email subject line was “The results are in,” with a mere 7.25 percent open rate. Of course, you’ll likely see your own subject line open patterns based on your target demographics and industry. These email statistics should all provide you some high-level insights you can use to improve your email management and methodologies. However, you won’t know if your new efforts are truly making you more effective or more productive unless you have a way to objectively measure your own results. The data points above apply to an average of thousands of people, but you’ll need to get a read on your own, personal metrics if you want to show improvement. That’s where EmailAnalytics comes into play. Our software integrates with Gmail’s API to provide you with real-time analytics on your email usage. You’ll learn how long it takes you to write and read emails, how soon you’re following up with your leads, how your email conversations play out, and how often you’re emailing the various contacts in your account. Best of all, you can chart these data over the course of weeks and months, so you can see how your new email strategies and habits are affecting your abilities in real-time. In the meantime, you can check out the EmailAnalytics blog for more tips and tricks you can use to enhance your performance, including these 101 Gmail tricks and hacks that can turn you into an email master. If you’re ready to give EmailAnalytics a try, sign up for our free 14-day trial! No credit card required!